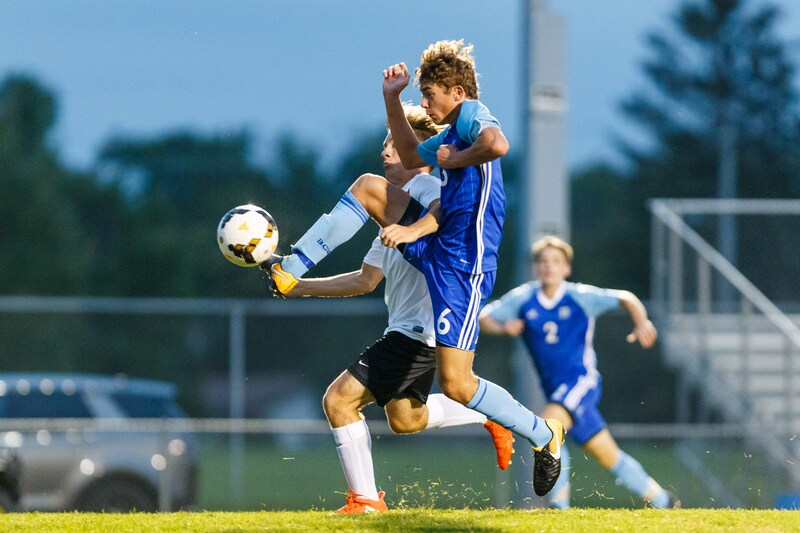 The chip that Brookfield Central's Alex Mirsberger wears on his shoulder has really paid off for the senior midfielder on the Lancers' soccer team. When asked why he stayed with soccer after starting to play in the local recreational league at 7 years old, Mirsberger laughed. "As you can tell, I'm not the biggest person (5-feet, 8 inches, 145 pounds)," he said. "But it's not the size of the dog, but the fight in it. I've always had that little chip on my shoulder. "I was pretty good early and I thought I could really see myself getting better and better." Mirsberger, who earned playing time on the varsity as a freshman, played so well as a sophomore he earned honorable mention on the Greater Metro Conference team. But last year he really cashed in, not only earning first-team All-GMC honors, but he was a first-team All-State selection as well. Look out for this season. "This year my confidence is huge. I knew I had a successful season," he said. "But I didn't really realize I would make all-state." Lancers coach Dan Makal was right to the point when he talked about if he thought making All-State changed Alex's attitude. "Nope," he said. "He is naturally a confident kid. His demeanor hasn't changed. Who he is hasn't changed. He just keeps on doing what he does. "He's a really humble player. He always looks for his teammates first. His success he will probably tell you is getting his teammates working really hard." As a midfielder, Makal nailed it when I asked Mirsberger about his role. "My main role is to control the game, making other players look good," he said. "Make sure I get them the ball; control the game in general. Over the years the attacking part of it has gone forward more. My freshman year I played further back, but as things went on I played higher up the field." Photo by Alan Herzberg, SportsPhotos LLC --- Last year as a junior, Brookfield Central's Alex Mirsberger earned first-team All-State honors. Alex did have an interesting response when asked whether he would score a goal or earn an assist. "I think it's pretty even," he laughed. "But that's a tough question." Makal talked about playing the midfielder position with the Lancers. "We kind of craft some different things for the guys," he said. "Alex is one. Playing the game instead of trying to play the formation or the system helps the rest of the team out. I think its been really massive for us." Makal also spoke highly about Mirsberger's talents. "He's explosive. When he has the ball he's always dangerous," he said. "He moves it very well. His ability is to process really well. He never seems to run out of gas." Alex also talked about the positive side of his game. "Being able to see the ball in play," he said. "Also playing with a chip on your shoulder, you're able to work as hard as you can, but still manage to stay into the game mentally, while working your hardest." Mirsberger was honest about his speed. "I'm fast, yes. But I'm not the fastest on the team," he said. "I just try to run as fast as I can. I do look at that as a strength - being able to get from one end of the field to the other (quickly)." 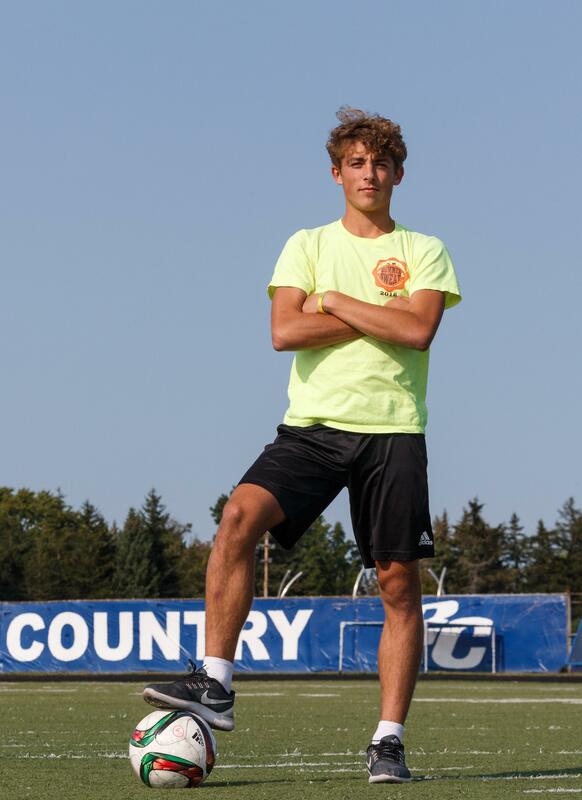 Alex, who has accepted a scholarship to play soccer at Marquette University, is already looking ahead when asked about what he needs to work on. "Playing quicker than I am now," he said. "Once you get to the collegiate level that's when it's like a whole new step. Always playing quicker is huge for my game." Makal recalled when he first saw Mirsberger play. "It was the summer coming into his freshman year," he said. "He came to our Lancer Camp. He was small, but he was really fast. He was really good on the ball. I saw him play there and I was impressed.
" He's kind of fearless. There's players who are very agile. They have the ability to move while making decisions. Alex was really good at that from the get-go. I felt that he was a kid who would do really well playing at the varsity level as soon as possible and turn out to be a 4-year varsity player." Makal knew had he something special with Alex and the Schweinert twins (Andrew and Austen). "Midway through his freshman year we had a lot of young guys playing then," Makal said. "The Schweinerts were both on the team playing serious minutes and Alex as well. We saw the three of them putting in some really good work, playing a bunch of minutes. "What was different about all three of them - Alex does his thing and the Schweinerts do their thing - is what makes it a good balance on the team. it's been helpful that they've had so many reps on the varsity level. To have freshman playing, it's not very common. This year we have two freshman on the team as well. That's good for us." Photo by Alan Herzberg, SportsPhotos LLC --- Senior Captain Alex Mirsberger uses his quickness and his ability to see the field to key the Lancers' offense. Mirsberger and the Schweinerts are now the senior team captains. Alex knows this a key part of his responsibility, but he feels there are more than three leaders on this team. "All three captains have to be leaders, but every senior on the team is also a leader. Every junior is a leader. We're all leaders. We can learn from the freshmen also." Makal knows Mirsberger will have to step up in is new role. "He is going to have to change a little bit with people looking up to him more," he said. "In years past he could just focus on his game. But now he's kind of has to look out for others." With Germantown and Wauwatosa West joining the Greater Metro Conference the competition should be better. "It will be fun - we have no idea who they are - we never really played them," Mirsberger said. "It will be an adventure. "We always have a team goal to win conference. We always in the top five spots. It's a big thing to put on your shoulders. It's a very competitive conference. The other teams will push you to do your best and that helps you in the post-season." Mirsberger will, of course, be one of the keys to Central's success and Makal talked about what makes him special. "Alex is pretty dynamic and I think that's what helps him," he pointed out. "He scored some pretty big goals for us last year. He had a couple game-winners. Those things stand out." Not bad for a guy with a chip on his shoulder. MOST MEMORABLE MOMENT: Beat Arrowhead in sectional final, 1-0, scoring the winning goal. WHAT DO YOU WANT TO DO IN THE FUTURE: Attend Marquette University on a soccer scholarship and study business.